The boys are once again out and about (or are they?) — this time in a diner (really?). 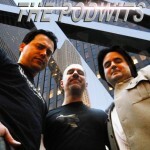 The wits of Pod get down and dirty to talk about animated films, Dion gushes over Kevin Cabbagepatch (?) while Brian cheats on with his wife! J. also takes the time to plug just about everything under the sun. He’s taking donations if anyone is interested. Trekkies in the White House!